Home › Home and Kitchen › Bogzon Creative Kitchen Onion Holder For Slicing & Cutting Stainless Steel Po..
Bogzon Creative Kitchen Onion Holder For Slicing & Cutting Stainless Steel Po..
Onion holder features unique stainless steel prongs that allow you to hold & slice onion hands-free. Holds & slices uniform sections of tomatoes, potatoes, cucumbers, carrots & even hard-boiled eggs! The tines are razor-sharp & easily slide into hard vegetables like onions, carrots or potatoes. Onion slicer guide has large comfortable oval, no-slip handle designed to prevent cuts & scrapes. Great for right or left-hand users - Rust-resistant - Hand-wash - Comes with odor remover attachment. This all-in-one kitchen gadget allows you to chop uniform slices of onionwithout having to ever touch it. See images above. It features ultra-sharpstainless steel tines that pierce even the hardest vegetables like carrots &potatoes. Just place your blade between the tines and slice away! The tinesare evenly spaced across the tool so even hard-boiled eggs are cut into evensections. 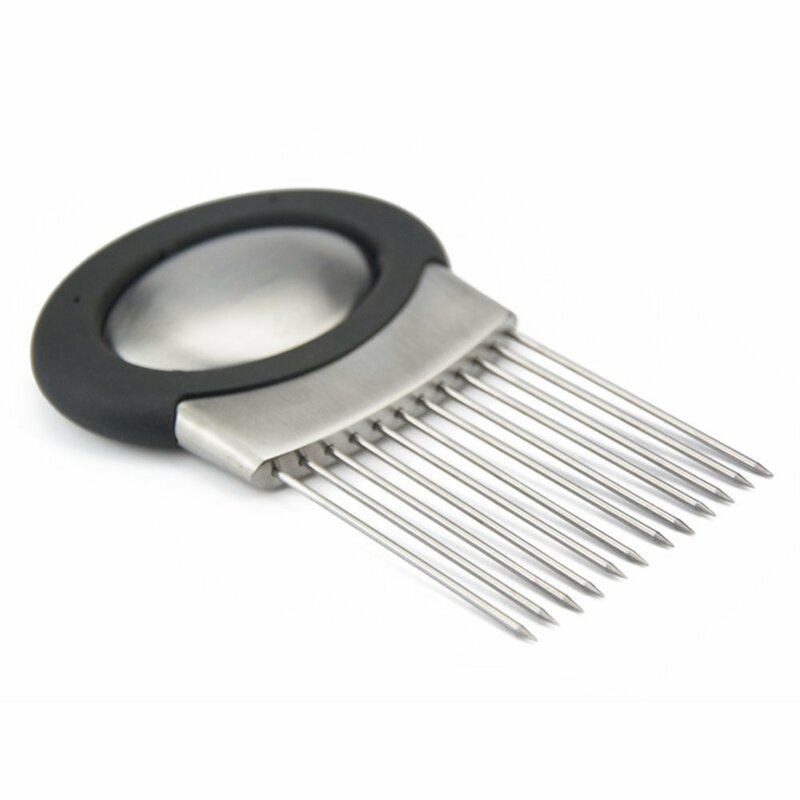 The onion holder also comes with an attachment that helps remove anyodor from your hands when you're done - No more onion smell on your hands!This quality food chopper is rust-resistant and easy to hand wash. Order yourstoday!